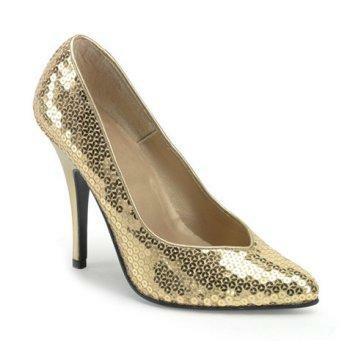 Nothing says “treasure” to me quite like gold, so enjoy these gold sequined shoes while we look at today’s query! And read through to the end for an important announcement. I’m seeking representation for my 35,000 word middle-grade adventure, “Chalk Cliff Treasure”, in which an overprotected city-girl challenges the dangerous forces of man and nature to hunt for a legendary treasure. Kaitlin Donohue, twelve, arrives at summer camp craving a week of adventure and freedom from her dictatorial parents. When she discovers the legend of a treasure buried behind the camp, Kaitlin sees the answer to her parental problem. With money of her own, she can afford to stay at camp all summer. But Kaitlin is more familiar with malls than mountains. Fellow camper Jenna Jordan impresses Kaitlin with her mountaineering skills and love of nature. Their friendship builds as they search for the treasure in between river rafting, climbing, and horse-back-riding. Then, they encounter a black-market treasure hunter willing to kill any competition. When a sprained ankle forces Jenna to remain at camp, Kaitlin continues the hunt alone. She risks lightning, treacherous heights, and predators, both wild and human, in her quest for the Chalk Cliff Treasure. I live in the Upper Arkansas Valley, the setting for the story. During the summer, I manage the local history museum, working with visitors of all ages, camp groups and the local school children. This is my first novel. This is a good, if not quite compelling, query. The action is certainly interesting, but I know next to nothing about the characters, and that’s I think the missing piece you need to hook an agent. What can you tell me about Kaitlin? Is she truly disingenuous enough to think that finding a legendary treasure will do nothing more than let her stay at camp all summer? Why does she think that she and Jenna are going to find it, when — presumably — others have tried before? What makes her special? A couple more specific points: I find a couple of your uses of hyphens slightly off. For instance “city-girl” and “horse-back-riding”, neither of which I think is grammatically correct. On their own, they don’t say much of your writing, but together, they cause an agent pause. I also don’t think “she discovers the legend of a treasure buried behind the camp” conveys exactly what you want to say. It could be taken to mean either she hears about the legend of the treasure, or that she discovers the legendary treasure. You’re better off being as clear as possible. Finally, you talk about “the dangerous forces of man and nature” and “predators, both wild and human”. I’m afraid this comes off as cliched, especially when used twice in a short query. How else can you convey what you’re trying to say? Readers, what do you think? Are you intrigued? And how many of you went to summer camp? I did, but there weren’t any horses or treasure, which I think is an abomination on the good name of summer camps everywhere! Oh, and the announcement! I’m opening up for more About My Query posts, so if you’d like me to comment on and feature your query on this site on a coming Friday, please email it to me at daphne.unfeasible@gmail.com with “About My Query” and your book’s title in the subject line. I’ll only be open for a short time, until I get a good number of queries to take me through the next couple of months. I’ll confirm receipt and give a posting date for all queries I receive, and let anyone whose query comes in after I close to try again next time. UPDATE: Closed to About My Queries! Keep reading for the next time we open! ← So What Inspires You? I think, for me, more info about Kaitlin is key. I know she's overprotected, but that's just her condition – what's her personality like? Is she a shy girl longing to be more assertive and exciting, or is she a thrill-seeker who's never had the opportunity to test her limits? I'd also love to know what her motivation is for continuing the treasure hunt after it gets dangerous. I mean, I'd love me some treasure, too, but if someone was willing to kill me for it, I'd probably back off. What keeps Kaitlin going? Speaking of danger, I'd love to know more about the antagonistic forces. As Daphne says, you're rather vague about it – I want to know more about how they're standing in Kaitlin's way. Otherwise, it sounds like a good, fun MG adventure. Good luck! As for your question, Daphne, I've never been to summer camp! I usually attended Theatre Camp for the summer, but we didn't stay overnight, so I don't think it counts. Had I known that legit summer camps would have horses and treasure, I might have bugged my parents to send me! I agree with Daphne's points and I find it hard to believe that more money is really the key to staying at camp all summer. If the parents are overprotective cash isn't going to make them less so; they would need a radical shift in thinking in order to let their darling go for more than a minimum stay. I like that you're so knowledgeable about the setting of your story. That's a plus. Daphne, I've been to Girl Scout camp both as a Girl Scout and a Brownie leader but I never got to go to one with horses either. At Girl Scout camp I literally drowned and was revived via CPR and now have a horror of swimming in natural bodies of water. Swimming pools only, thank you. Or the ocean. Minds are funny things. Thanks for bravely offering your query up! I learn a lot from these. Overall, I'd say you have the format down perfectly, and your balance of story information to personal information works well for me, all in that tiny little query space. Well done! I agree that I'd like to know more about Kaitlin. I think that's because I'm reading this as a person vs. nature story, and, to me, those are as much about how the person involved overcomes their own fears and conflicts within as it is about whether the person has the skills and luck to achieve their external goals. I'm thinking of stories like A Week in the Woods by Andrew Clements and My Side of the Mountain by Jean Craighead George (also about a city kid! ), although I recognize that you've got a different plot structure with Kaitlin's treasure hunt. If this is really primarily a book about Kaitlin vs. the black market treasure hunter, I'm not getting that from my read of your query; I'm seeing that as a complication rather than the real conflict, mostly because there isn't much about him/her included here. If I'm wrong, you might want to compare my reaction with other readers' interpretations. I agree about the hyphens (and I'm hyphen-prone myself). I like that this seems to be a book about a girl who's physically taking on her challenges too; the things she's learning and taking on involve strength and flexibility of the body, not just of character, and I appreciate that. I don't read enough of those. I'm also interested that she's choosing these challenges; most books I can think of with female protagonists in the wilderness (Julie of the Wolves, A Girl Named Disaster, and Island of the Blue Dolphins) are reacting more to emergency situations than about choosing the wilderness, if that makes sense. Thanks again — best of luck with the rewrites! I am intrigued, for sure, and would definitely like to read more For me, it's Kaitlin's rebellious nature and her friendship with such an obviously fearless, brave girl as Jenna. These two points definitely convinced me. Thank you very much, Daphne, for your valuable – as usual – advice, and good luck, WO! I agree with the others, would like more info about Kaitlin so I can connect with her. If I was a middle grade student, I would read this book just based on the description in the query. It's the kind of thing I loved to read as a kid. As an adult, I'd probably want to know more – with less time to read, something has to make it stand out as better than the average book. I did go to camp and have many fond memories – no horses, but archery was awesome. I wonder if they even let kids shoot arrows at camp anymore? Unfortunately though, I never heard any legends of treasure – that would've been cool! Thank you all so much for your comments! All of them are very helpful. Especially, thank you Daphne!